You are here: Home / Adam in the Media / Adam Lambert Marries Queen and Sports! 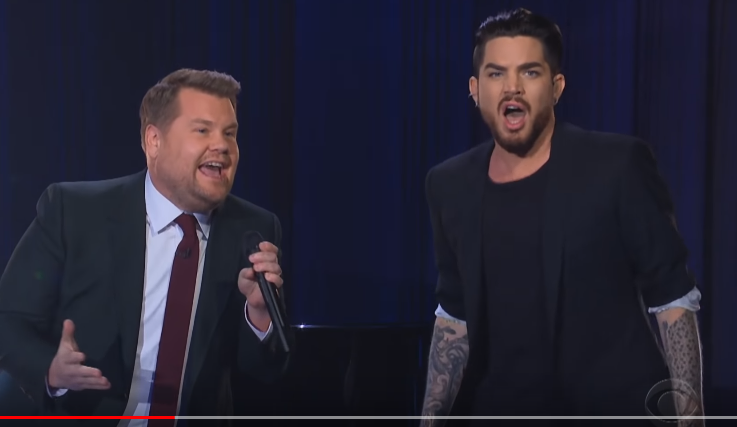 Adam Lambert was the surprise musical guest on James Corden’s Late Late Show Sunday night giving his all in a parody with James for the AFC championship game, which had ended just hours before. They sang a comical version of the game’s highlights to Queen’s Don’t Stop Me and of course, they both killed it! I think the funniest part was the missed chest bump at the end! Next stop on Adam’s sports-related performances? Getting him to the Super Bowl Halftime Show!! Hi Carol…that chest bump was hilarious. When these two men get together anywhere they make us all laugh. FYI…I’m not real sure Adam wants to do half-time show for couple reasons. The performer has to pay big bucks to perform and by half-time most people are drunk and don’t pay much attention to who is performing anyway. I’ve been to so many NFL games in my lifetime and as I mentioned it gets kinda rough by halftime as most are drunk. Katy Perry got very upset when she was told she had to pay to perform but of course she did perform anyway..
At the moment the only James Corden Shows we get in Adelaide, are all repeats, which is very annoying. I shall have to find this on YT. Loved this….especially the chest bumping. I wonder if Adam ever really watches football at all, but this was great. I loved his pants! I love James Corden and he has been good to Adam for sure. I caught this by accident and so happy I did. They are so funny together. ADAM is so much fun to watch. Why is it that when I click on the YT link it always says – “Video Unavailable” – “This Video Is Not Available” – it’s very annoying…. Very fun, but I can’t imagine how hard it is to learn new lyrics to a song like that!